We’ve all had those mornings where we sleep through our alarm, waking up in a panic with very limited time to get ready. We struggling finding something to wear, eat a quick breakfast and try to make ourselves look presentable. Of course, the one day we wake up late, we have a bad hair day. These rushed moments happen to the best of us, so it is important to have a few hair tricks up our sleeves to help us out the door quickly. While running late can derail our morning grooming, for our quick and easy hairstyles to work, proper hair care maintenance is important. Using Essentious hair care products helps to maintain healthy, glowing hair that will always look good no matter how late you are running. Essentious hair care is sulfate-free, moisturizing hair care using natural ingredients that heal and moisturize your hair. Using Essentious hair care will prep your hair for all the quick and simple easy hairstyles that will get you out the door fast. These easy hairstyles are not only quick and easy but also on trend! As seen on many of your favorite actress and on the runways, all you’ll need to achieve these styles are a few products you likely already have at home. A perfectly imperfect look, this textured and slightly unkempt up-do adds a chic edge to your hair and can be done in no time. You’ll need: a teasing brush, bobby pins, a hair elastic and some hairspray. Part your hair as you normally would. If you want to try something new, part your hair off to the side. It works beautifully with this hairstyle. Tease hair at the crown using your teasing brush. Gently smooth the top so that it looks naturally full and voluminous making sure no knots are showing. Pull all your hair into a low ponytail at the nape of your neck and secure with a hair elastic. Twist the pony into a bun, securing with a few bobby pins. Loosen some pieces in the bun to give it a messier look. Set your new, quick and easy hairstyles with some hairspray. A sleek and chic look that takes no time at all, this particular style is especially useful for when you have no time to shower. It looks super sophisticated and can be done in minutes! You’ll need: a flat iron, hair gel, hairbrush, water in a spray bottle, one bobby pin and a elastic hair band. Brush out your hair so it is soft and manageable before running your flat iron through it, straightening your hair. Spray water on the top of your head with the spray bottle so the hair is damp. Pour a dime-sized amount of hair gel into your palm and spread the product between both hands. Run your gel-filled hands gently through the top of your hair. Pull the hair back into a low, slick, tight ponytail. Tie back with your hair elastic, reserving one thin strand from the nape of your neck. Wrap the hair strand around your hair elastic so you no longer see it. Pin it invisibly at the nape of your neck pinning in the strand to secure it. Lastly, run your flat iron through the ends of your ponytail to smooth it out so it is nice and sleek. A super simple bun style that is not only always on-trend, but takes only minutes to achieve. Perfect for those late mornings. You’ll need: a hairbrush, hair elastic, bobby pins and hairspray. Brush your hair out so it is smooth and easy to style. Flip your head upside down and secure your hair into a high ponytail, securing all your hair into a ponytail at the top of your head. Tie with an elastic hair tie and smooth out any bumps or strays with a hairbrush. Spray with a stronghold hairspray to secure all the strands in the high pony. Twist the pony tightly and wrap it into a bun. Pin the bun into the crown of your ponytail, pinning invisibly to secure the bun. Finish with a mist of strong hold hairspray. And off you go for the rest of you day. No one will be any wiser that you woke up late! Quick and easy fixes are the best when running late. Especially ones that provide instant gratification for those bad hair days. This fast and fierce hairstyle will give you luscious waves in under 5 minutes! You’ll need: a flat iron, hair elastics, a hair prepping/protecting spray and a shine serum. Prep your hair with a heat-protecting spray or a setting spray to protect your hair and set the curl. Take a 2-inch section of your hair and split it into two even halves. Twist each section (now 1-inch each) and wrap the pieces around each other and secure with an elastic band. Do this to your entire head. Hold the end of your twisted ponytail and in a downward motion, pull and clamp your flat iron down the ponytail. Make sure you go through each section evenly so the heat from the iron clamps each twist. Give the strands a few minutes to cool down before untwisting them gently. Flip your head to shake you hair out, very carefully and lightly using your fingers. Flipping your hair back up, squeeze a few drop of a shine serum into your hands and gently run your fingers through your hair, carefully combing out the curls for a natural look. A braid is one of the easiest and quickest hairstyles for days where we are running late. Taking just a few extra minutes to try a different twist to your traditional braid is a fun and creative way to amp up a boring hairstyle. This particular style is actually perfect for days where a morning shower just won’t happen. You’ll need: a texturizing spray or powder, hair elastics, a smoothing product and some hairspray. Spray or powder your texturizing product of choice to your roots to lend some volume and to provide a bed-head hair effect. Tame your flyaways and frizz with your smoothing product before beginning. Gently brush hair off to one side and secure with a hair elastic. Separate hair into two equal sections and begin braiding the inside section as you normal would. Secure with a hair elastic. Separate the un-braided section into three parts. Begin by weaving the first strand through the existing braid using the loops as a guide. Repeat with the remaining two sections until all the pieces are woven into the braid. Finish with a mist of hairspray to hold the plait together. A bad hair day can really ruin our entire day. 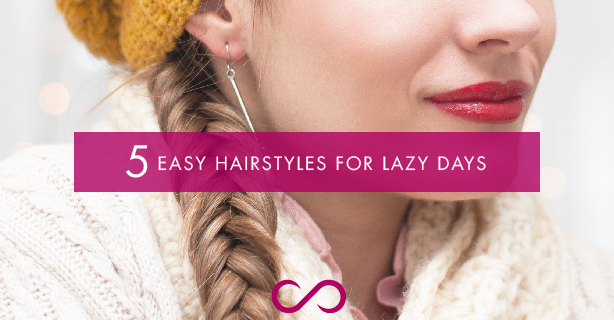 Luckily, these easy hairstyles will provide instant gratification and have your friends and co-workers asking you how long it took to style your hair in the morning.